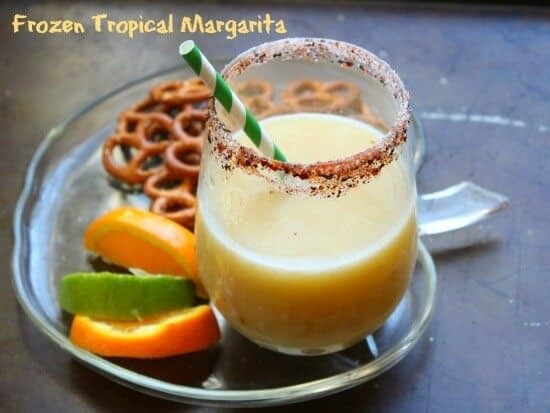 Perfect for you weekend staycation, this frozen topical margarita recipe is a combination of banana, orange, lemon, and lime with a sweet-smoky chipotle rim. When you sip the sweet slush you get the cool creamy goodness followed by a smack of chipotle sass. Now that’s my kind of drink. You will need to plan ahead for this because the bananas need to be frozen. I like to take my almost-too-ripe bananas and toss them in the freezer. That way I have them whenever I want something banana-y. You don’t even have to peel them. You can run a little warm water over the frozen banana to make it easier to peel, then cut it in chunks. Whether or not you add simple syrup to this cocktail depends a lot on your preference for sweet and how ripe the banana is. I’d make the cocktail without it and then add it last if it was necessary. I know I am showing this with a straw but if you sip it from the glass you get all kinds of cool textures and flavors swirling around your mouth. There’s sweet, creamy, smoky, spicy, hot, cold, rough, smooth…. I like to think of it as a thesaurus in cocktail form. The rim is easy to do. It’s ground up chipotle peppers mixed with an equal amount of sugar. You just dip your fingers in water, run them around the rim, and then dip the rim in the sugar and chipotle mixture. You can use commercial powdered chipotle but I like the texture and color that occurs when I grind it myself and leave it kind of coarse. I never traveled until my husband and I got together around five years ago. One of the first things he did was to take me on a cruise to the Caribbean and of course we stopped in Cozumel. I am all about the restaurants when we travel and he is all about the shopping so Cozumel was a great stop. We were sitting in this little Mexican place all romantic and relaxed, street musicians playing a song for us, and smiling at each other like you do when you are first together. The food smelled amazing. When the server brought us our chips and dip I was off in my own fluffy pink fantasy land of my happily ever after, you know? I barely glanced at it because, hey, I’m Texan… we have the whole Mexican food thing down. I dipped my warm chip deep into the bright orange queso and took a big bite. The next thing I knew I was gasping for air and gulping down water because Hell had touched my throat — the burning fires of eternal damnation were dancing on my tongue and creating an uproar in my stomach. Sweat broke out on my forehead and I remember thinking that it was good that Mexico is a largely Catholic country because I was pretty sure I was going to need an exorcism… or maybe last rites. Being a protestant I wasn’t sure how that worked. You see, the queso was not queso. It was a local salsa made from habenero peppers that were cooked down to a thick, intense paste. This frozen, tropical margarita would have come in handy to quench the fire, you know? Your mouth does not have to be burning to enjoy this delicious cocktail but if you ever do go to Mexico make sure you know what’s in the dish, y’all. If you need a margarita set I love this one by Libbey’s – and it’s on SALE! It was 89.99 and it’s now 19.99 on Amazon! Pitcher and 6 glasses so buy yourself a gift. If you buy through this link it does help support the blog with a small commission and it doesn’t change your cost. Thank you! 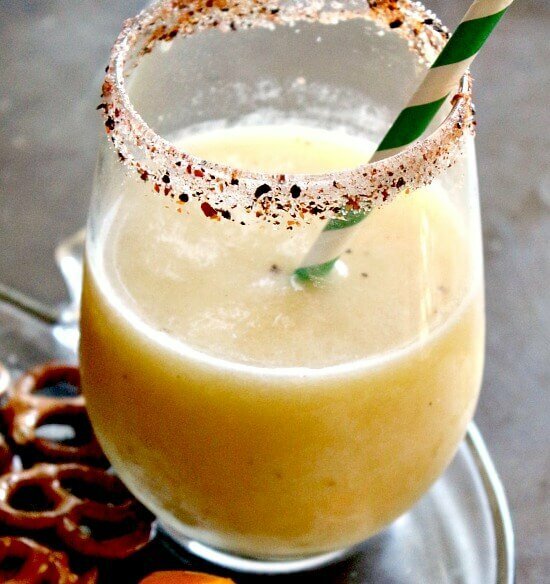 A sweet, tropical drink that has tons of banana flavor. The rim of the glass is coated with a spicy sweet mixture so if you drink from the glass (rather than a straw) you’ll get that icy-hot combination in every sip. Mix the chipotle powder and sugar together in a saucer. Wet the rim of your glass with a little water or egg white. Dip the glass into the chipotle mixture and twirl it to coat the rim. Peel and cut the banana in chunks. Add the tequila, banana liqueur, Triple Sec, lemon juice, lime juice, orange juice, simple syrup, and ice. Blend until smooth and slushy. Pour carefully into prepared glass and garnish with citrus as desired. OMG, I was just going over past linkups and how did I not see this?!?! This looks so amazing!! Thanks so much for linking it up with us!!! The drink seems very healthy and I can say that the glass rim with chipotle mix is just a brilliant idea. Thanks Marye for sharing this recipe. Luckily no ice here in Texas but it sure did get cold! Very cute story!! I love this marg too!! This sounds awesome! I love the “chipotle sass” 🙂 how fun is that?? This is going on my to-make list for sure! Hi. I found your blog today and shared this recipe. We have a friend who loves Margarita’s so I am excited about this recipe. I intend to make it the next time he comes to visit. it is like minus 20 where I live and this just reminds me of summer. Love this recipe. I need to try this. Ohhh I love the chile rim on these and I am a sucker for mango margaritas. I might have to make these later today! !